Individual products – shaped easily. At the end, each product is only as good as the team that produces it. This is in contrast to the means of production, which are decisive for the quality and a smooth workflow. JÜNGER – relies on both! We have protective manufacturing methods in the field of deformation (dishing presses and flanging machines). Material weakening in the knuckle area (board) is much below 10%. Because of wrinkle-free production, even thin-walled materials can be processed in high quality. Our heads are exclusively produced by experts, who support the precision of our products through their know-how. Sheet metals with a length of 5000 mm and strength of 2-18 mm are welded in our combined plasma-WIG method. This method is extremely protective to materials because the low heat supply in the material causes only negligible structural changes in the base material. This consequently guarantees economical and high quality welding. Our bevelling / camfering process of the heads is possible up to a diameter of 4300 mm. This work, very high quality in detail, is done on our lathe machines up to a diameter of 2750 mm. Moreover, we also machine the edges on an edge grinding machine. For further processing at the customer’s place, this implies problem-free workflow in the automated production e.g. with plasma or laser welding technology. In case of special processing, necked-in openings and extrusions are possible with diameters of 60-800 mm. Cones with an edge length up to approx. 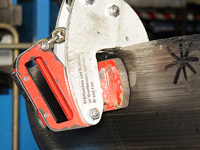 2000 mm are produced in a material-protective manner on a cone roller. Edge lengths up to 2500 mm are produced in best quality on our CNC sheet metal bender. are accepted and executed according to requirements.